Sandra Lopez and her 2-year-old daughter Areli play together in their small basement apartment in a Carbondale parsonage. Sandra Lopez, a 42-year-old woman who has taken sanctuary against deportation in a Carbondale parsonage, came to the U.S. nearly 20 years ago, running away from the violence, government corruption and poverty of Chihuahua, Mexico. She said in an interview that desperation led her to take a dangerous path into the U.S. She paid a coyote to take her across the border, only to find the smuggler drunk. She was left in the desert for a day and a half without water, in the cold night with scorpions and spiders, before being picked up again. All of this to have a life in the U.S.
“My husband and I had a lot of dreams. We were looking for a better opportunity and to live in a safer place,” Lopez said via a translator. After making it into the U.S., Lopez came to the Roaring Fork Valley. “I’ve done the work that so many of the immigrants do in this country: cleaning homes, cleaning hotels,” said Lopez, who was living in Silt, and has also become a local activist for immigrants’ rights. In 2010, she was arrested on misdemeanor criminal mischief and domestic violence, but the charges were quickly dropped. She says the arrest was a mistake, after one of her children mistakenly dialed 911. Nevertheless, the arresting officer immediately reported her to U.S. Immigration and Customs Enforcement after she couldn’t provide a Colorado ID, she said. “Within a few hours of being in jail that night, before dawn had even broken, the officer came to tell me that ICE was calling to interview me over the phone,” she said. No other attorney would take the case, because two days just wasn’t enough time. So she had to stick with him, and she paid him another $3,000 to appeal the decision, which he also lost. Lopez then hired Glenwood Springs immigration attorney Jennifer Smith, who was able to get Lopez a stay of removal. This was good news, giving Lopez the opportunity to stay with her family, allowing her to work legally and get a driver’s license — even a Social Security number. “In some sense I was more secure than I had been before,” she said. A stay of removal, however, is only a temporary fix. As part of that program, Lopez had to report to ICE each year to give an update on where she was, what she was doing and ensure she kept a clean record. But Lopez said that if she had gone to her annual ICE check-in on Oct. 19, she would have been deported. The day before, her attorney called to inform her that her stay of removal had been revoked. Instead of going to her ICE check-in, she got her 13-year-old son ready for school, while keeping quiet about the news, and then packed a suitcase with things for her and her 2-year-old daughter. She called into work to let them know she wouldn’t be in, holding her tongue about why. In March of this year Carbondale’s Two Rivers Unitarian Universalist congregation decided to offer sanctuary to undocumented immigrants, in response to developments in national policy. And though Lopez had attended and spoke at a prayer vigil where the church announced its decision, she hadn’t guessed she would be the one to use it. “I left everything behind. My house, my job, my role as a mother,” said Lopez. Lopez says that she and her attorney still don’t know why the government changed its course in her case. “They simply denied (the stay of removal). It’s very difficult under the Trump administration for us to stay here,” she said. “At the end of the day, we take sanctuary to be with those who are most important in our lives, which are our children,” Lopez said. The congregation is doing what it can to fix up the basement, installing some carpet and donating a few pieces of furniture and a crib for Lopez’s 2-year-old daughter. 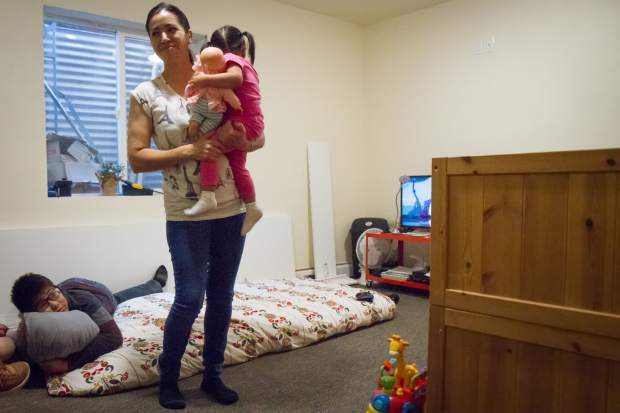 But the space is still claustrophobic: a small living space with a mattress on the floor for when her 13-year-old son can visit, a bathroom, a tight bedroom down a hallway squeezed by a washer and drier. Though she’s grateful to the Two Rivers congregation for its support, she said that staying in sanctuary, in some ways, is like being imprisoned. She can’t work. She’s afraid to go outside or even answer the door. “This has marked my life forever, ever since 2010,” she said. “And all my work has been to pay the government and to pay attorneys. I have spent around $28,000 throughout this process. And all my work is going to other people. I haven’t been able to provide a lot of things for my children. “In spite of all that, I’m still here in deportation. It’s like they don’t see me as a mother who just needs to be here with her children,” she said. “At the end of the day, they didn’t accept my attempts to become a resident here.